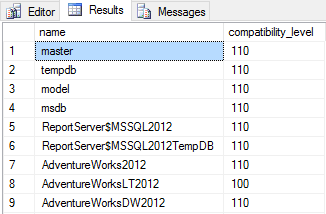 Have you ever wondered what versions of SQL Server related to the compatibility levels? This article will show you the levels and also how to change existing databases to different SQL releases. Note: Azure SQL Database V12 was released in December 2014. One aspect of that release was that newly created databases had their compatibility level set to 120. In 2015 SQL Database began support for level 130, although the default remained 120. Starting in mid-June 2016, in Azure SQL Database, the default compatibility level will be 130 instead of 120 for newly created databases. Existing databases created before mid-June 2016 will not be affected, and will maintain their current compatibility level (100, 110, or 120). If you want level 130 for your database generally, but you have reason to prefer the level 110 cardinality estimation algorithm, see ALTER DATABASE SCOPED CONFIGURATION (Transact-SQL), and in particular its keyword LEGACY_CARDINALITY_ESTIMATION =ON. For details about how to assess the performance differences of your most important queries, between two compatibility levels on Azure SQL Database, see Improved Query Performance with Compatibility Level 130 in Azure SQL Database. Execute the following query to determine the version of the Database Engine that you are connected to. As you can tell from my results, I will not be able to change the compatibility level of any database to any of the newer releases SQL Server, like 2014 or 2016. I am using SQL Server 2012 on this instance. Note: Before proceeding, please check the Reference Microsoft article: ALTER DATABASE Compatibility Level (Transact-SQL) to see the differences between compatibility levels and also ensure you follow best practices.